Acne fighters that take you from day to night from Neutrogena, Bioderma, Avene, Vichy and Olay! 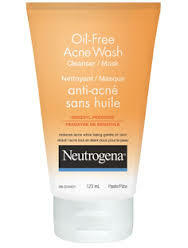 Neutrogena Oil-Free Acne Wash Cleanser/Mask - 123ml - $7.97 - a gentle, oil-free, daily cleanser that washes away clean leaving skin feeling smooth and soft as well as being an intensive mask that penetrates the pores for deep cleansing and extra oil control. Contains 3.5% benzoyl peroxide to kill acne-causing bacteria to reduce the amount and severity of existing acne while preventing future breakouts and still being gentle on the skin. Bioderma Sebium AI Correcteur 2-in-1 Tinted Anti-Blemish Care - 30ml - $24.95 - the lightweight, non-oily texture offers a dual concealing action with a green corrector in the cap to neutralize redness and a universal beige shade in the tube to conceal blemishes and even out the complexion for a natural result. Along with concealing, they also treat with Fluidactiv - which neutralizes the bacteria to prevent and treat blemishes and Zinc Gluconate - to regulate sebum and soothe inflammation. For skin that looks better right away and in the future. Avene Cleanance Expert Emulsion - 40ml - $28.50 - can be used morning or night to directly target imperfections without drying out the skin while mattifying and moisturizing in the process. Contains Monolaurine - to regulate the overproduction of sebum and mattify the skin; X-Pressin - prevents and promotes blackhead reduction and gently smooths the skin; and Diolenyl - prevents and limits the development of blemishes. And because the formula is oil-free and doesn't have any sticky feeling, it's also a great makeup base. Vichy Normaderm Night Detox - 40ml - $29.95 - offers anti-imperfection clarifying care that works while you sleep to control excess sebum, reduce imperfections and the look of pores, clarify and even skin tone. It detoxifies with Eperuline - calms inflammations and soothes skin; LHA - attacks bacteria to unclog pores; Salicylic Acid - exfoliates dead surface skin cells and cleanses pores; and H.E.P.E.S. - more exfoliation - and purifies with Perlite and absorbing powders to absorb nightly excess sebum production for skin that feels clean and looks radiant come morning. Olay Fresh Effects [SPF 15 Moisturizer] Lotion - 75ml - $15.99 - with an oil-free, non-greasy formula that locks in moisture for 24 hours to rejuvenate skin with a refreshing essence of honeysuckle and white tea for skin that is beautifully protected. Available now in drug and mass retailers across Canada.